350-Lumen: With a CREE XPG2-S3 LED incorporating the revolutionary adjustable focus into headlamp, it emits a beam with extended reach about 120m. Easily zoomable from wide to narrow beam. Quick accessible different beam levels to meet all lighting requirements. LONG LASTING: Powered by 3x AAA batteries (Not Included) offers up to at least 8hrs illumination, non-diminishing brightness. Genuine CREE LED promises boasting an extended 50,000-hour lifespan. 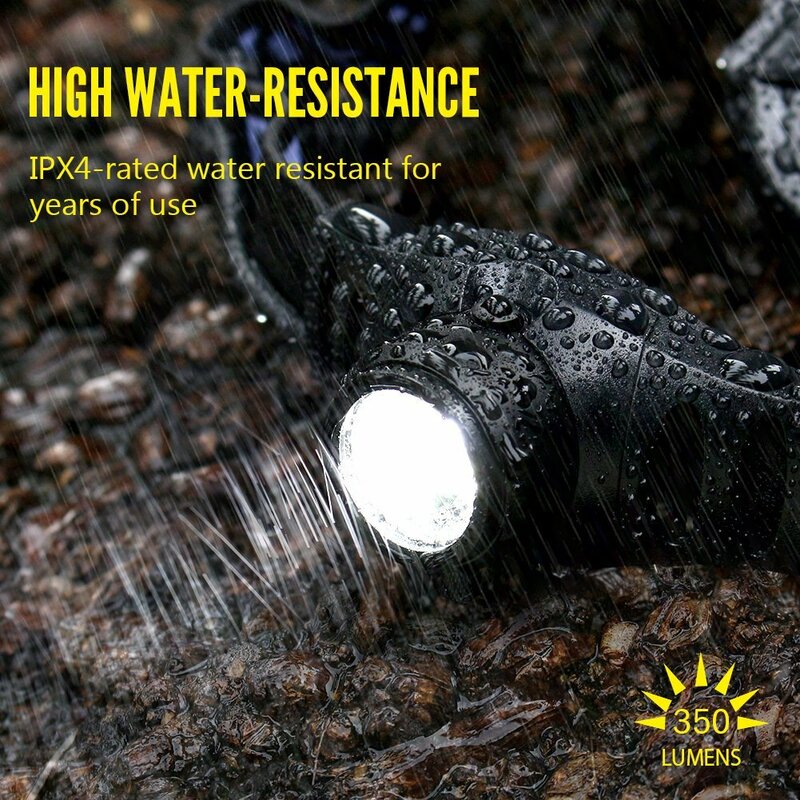 WATERPROOF & DURABLE: IPX4-rated water resistant and rubber battery cover design for protecting against splashing or spraying water from any angle. Metal and ABS congregated head guarantees an incredible durability. 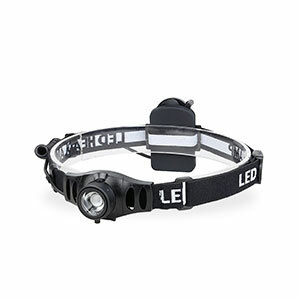 HANDS-FREE LIGHT: Optimal combination of lightweight, comfort, brightness & adjustable headband makes the headlamp flashlight keeping your hands free to perform the real work, no confliction. RISK-FREE PURCHASE: BYBLIGHT LED headlamp, Carry Pouch/bag, user manual, and our worry-free 18-month warranty and friendly customer service(support@byblight.com). This powerful and rugged light has two-position switch offering different levels beam to meet all your requirement. An adjustable angle head and comfort fit strap for extended wear helps releasing your hands & focusing wherever needed. Ordinary headlamps promise to qualify your requirement of lighting, but the trouble is, most of them are so heavy and quickly become too uncomfortable to wear it. Especially when you are in a long journey and a light is needed, such as camping, hiking, hunting, grilling, fishing, or even playing with your kids. And if they are light enough for long-lasting wearing, but so dim even it’s turn on. 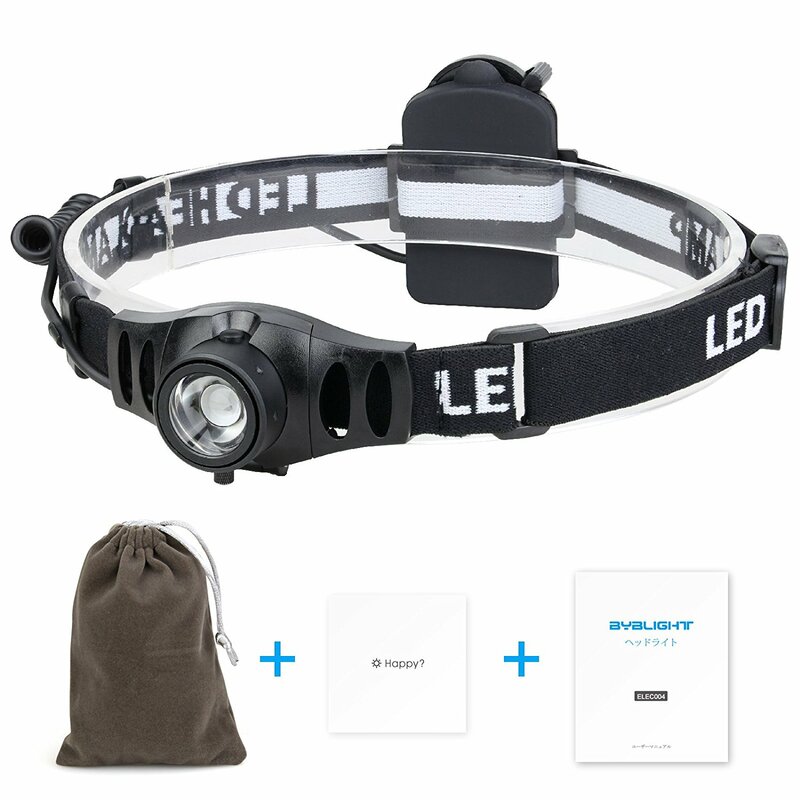 BYBLIGHT LED headlamp, not only super bright(350lm), but also comfortable and easy to wear it. It is your ideal on-the-go tool whether you’re working around the house or out for a late-night dog walking.
? 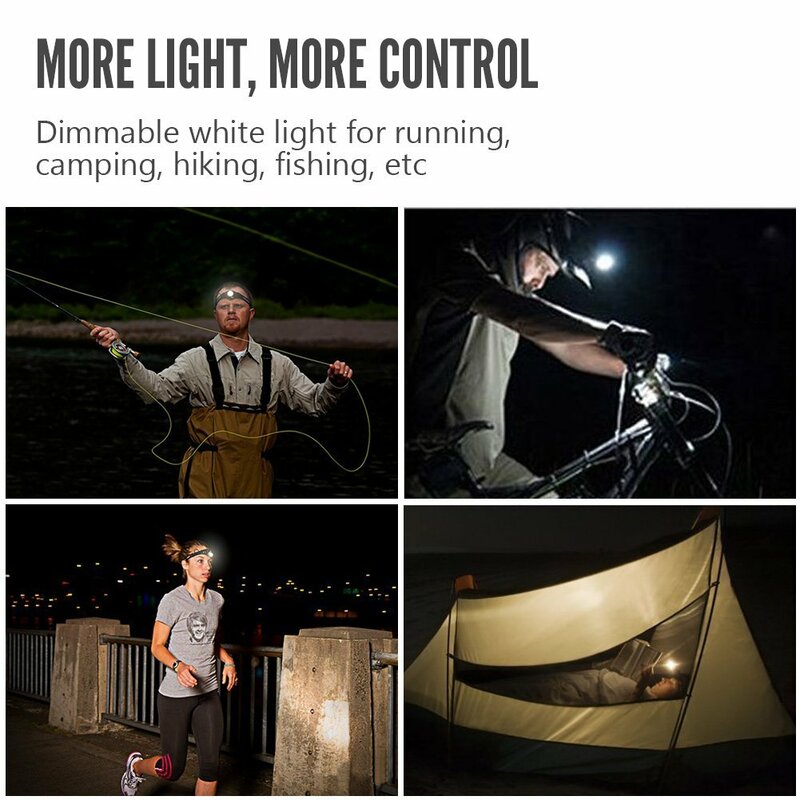 Incredible quality & affordable price head lamp.
? Adjustable & comfortable strap fits adults or kids, guarding your children’s safety when play outside after dark.
? 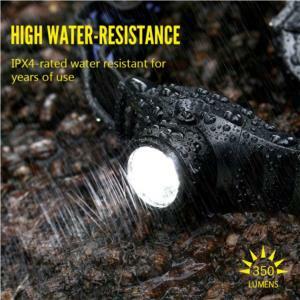 IPX4-rated water resistant for years of use.
? Flannelette bag/pouch for everyday carry.
? Offering up to at least 12hur illumination from 3x AAA batteries(Not Included). Can the light angle be adjusted? I need this lamp for night reading. Yes, it comes with adjustable angle head, it can rotate 90 degrees, so you can adjust it to the angle as your need. It can reach up to 350 lumens, so it's bright. The lamp looks rather small, how bright is it? I go camping a lot. Will it do the job? Don't be fooled by its size. Actually, it's bright. 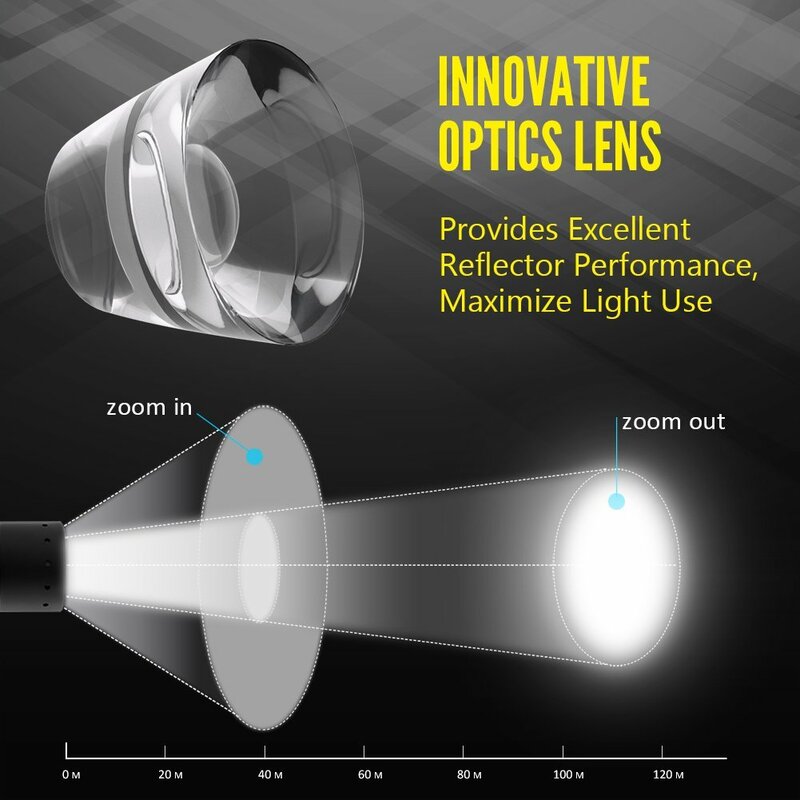 With the latest optical digital reflecting design, it can reach up to 350 lumens. Besides, this lamp only weighs 85g(0.19Ib), compact and lightweight, comfortable to wear. Even you wear it for a long time, there will be no sense of fatigue. It says "Focusing", what actually does this mean? The "Focusing" means the design of the lamp head adopts the latest technology--upgraded telescopic focusing system. It can easily switch between flood light or focused spotlight according to different needs, to light up long or close distance, large or small area. 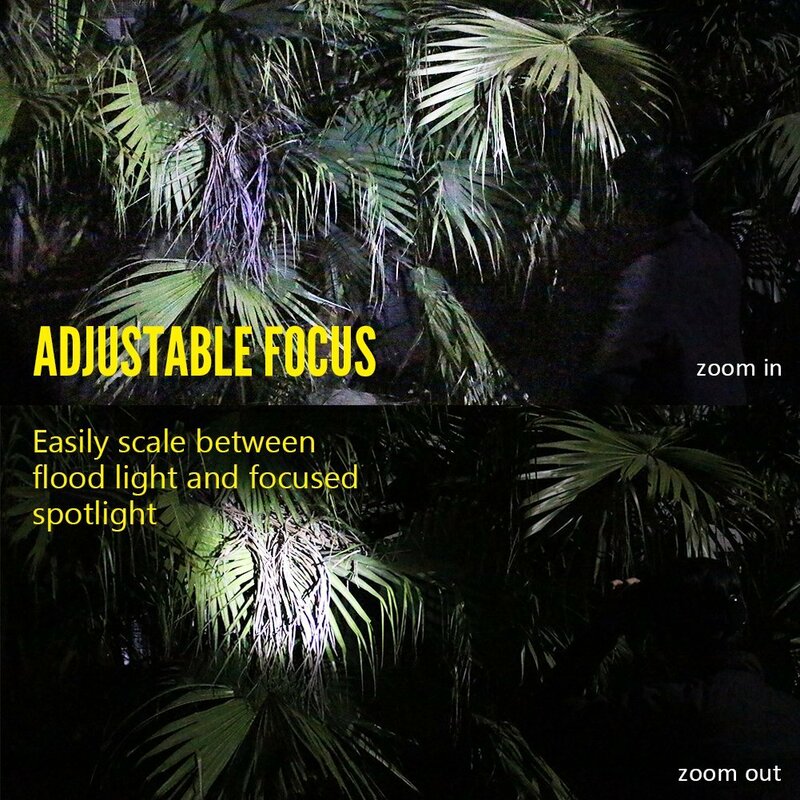 It's of the same design principle as the adjustable/zoomable flashlight. 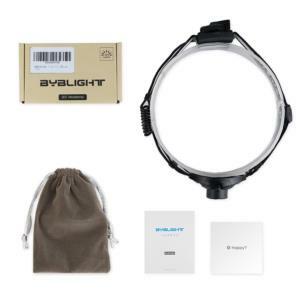 Is this light suitable for night running? Yes, it will do a great job. 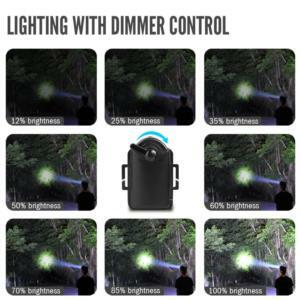 It's 350 lumens, bright enough to make you noticeable at night as well as light up the way. Also it's very lightweight (85g/0.19Ib), comfortable to wear. 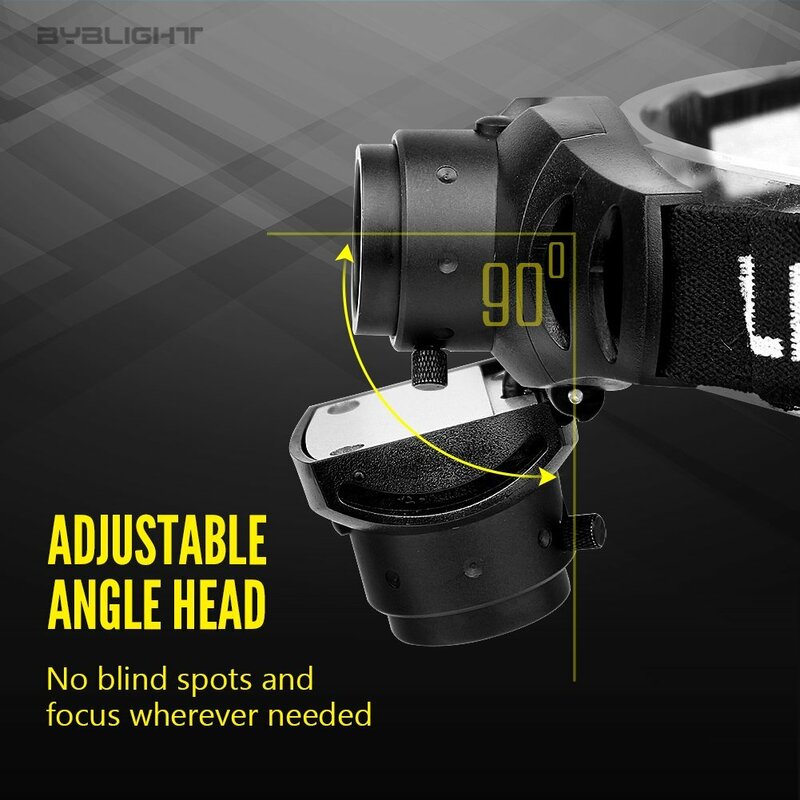 You can adjust the lighting beam angle as your need to light up the way(90 degrees adjustable). I am an outdoor enthusiast, i am so impressed with this focusable headlamp, i took the headlamp for my 3 day camping trip, i wear it everynight after sunset. the lamp was lightweight and so comfortable to wear. i almost forgot i was wearing a headlamp if there wasn't a lighting beam in front of the path. and i am so happy to share the pictures for its wide and narrow beam illumination, i coun't have been more pleased with the excellent performance of the light. highly recommend. I have purchased dozens of headlamps from Amazon, most of them doesn't have adjustable focus, but this one, not only comes with adjustable focus, but also has dimmer control. This means you can choose the brightness level and mode whatever you want, so it helps to prolong battery life. For other headlamps that I had purchased, I would use 100% output all the time. But for this light, I use the lower lighting beam when no need of the higher beam. Great Headlamp, and very bright. Feel comfortable when wearing. The light is adjustable with dimmer control. A fantastic tool for handyman. A safe tool when camping and running. Highly recommended! Best headlamp I've ever owned. I work for the phone company and need both hands to fix wires and climb poles. The battery pack on the back balances the weight very well and the light stays in place while moving. The light is very bright and can be easily dimmed with the dimmer on the battery pack. It gives off a natural light so that colors are shown properly which is important in my job. The tilting action is very nice if your working on something directly in front of you or reading. I would buy another one of these headlamps in a heartbeat. Bought this as a gift for my grandson and it was a hit! He loves it and it's easy to operate. Would definitely buy it again! This lamp is smaller than some others that I have. It doesn't have a band to go over your head to prevent it from slipping down. It doesn't have a rechargeable battery. It is nice and compact and comes with a small carrying pouch. It uses AAA batteries which is good as this way I can keep spares on me and just use rechargeable batteries. 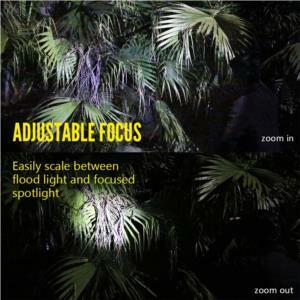 The light has a small slider on the front to easily switch from a focused light to a flood light. The batteries are in a compartment by the back of your head. The strap is adjustable to make it more comfortable. The batteries are not included so make sure to buy 3 AAA batteries in order to be able to use this light. I only had this light for a few weeks but I'm planning on bringing it to camping with me when the summer comes. I'm going to strap it on my kids head as it makes it easier for them to not have to carry a flashlight while walking in the dark. It's 350 lumens so it's not extremely bright, BYBLight makes another model that I also have that is brighter and more expensive. Overall I'm happy with this model as it's more compact and lightweight so better for my kids, though adults can also use it. I added a few photos so you can see the same light in one area, one picture in flood mode and one in spot mode.